Tonight in Coney Island, the sky will light up with a pyrotechnic display rivaling that of last week’s “Electric Eden Revisited” in this fabulous photo by Bruce Handy. It’s the last Friday night fireworks of the summer and is expected to be spectacular. Best viewing is on the Boardwalk from West 10th to West 12th Streets, on the Wonder Wheel or from Steeplechase Pier. 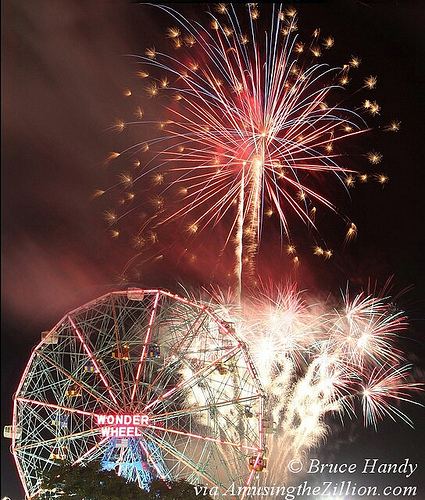 The fireworks are just a necklace on the royal jewel of Coney Island, the WONDER WHEEL, the Queen of Electric Eden. The WHEEL’S royalty along with the Vourderis family passion and love make the photo. Special thanks to Eddie Mark for inviting the People’s Playground Paparazzi to the Community Board 13 Fireworks Party and allowing all of us viewing form the roof. Also thanks to Kenny Lombardi who helped me with the camera settings.